This recipe incorporates seasonal fall favorites – brussels sprouts, apples and pumpkin seeds! This dish is rich in antioxidants, vitamin C, vitamin K, prebiotics (to promote gut health), fiber, omega-3 and magnesium! Enjoy it served alongside a filet of salmon with whole grain brown rice. 1. Preheat oven to 425 degrees. Grease a sheet pan or line with parchment paper. 2. 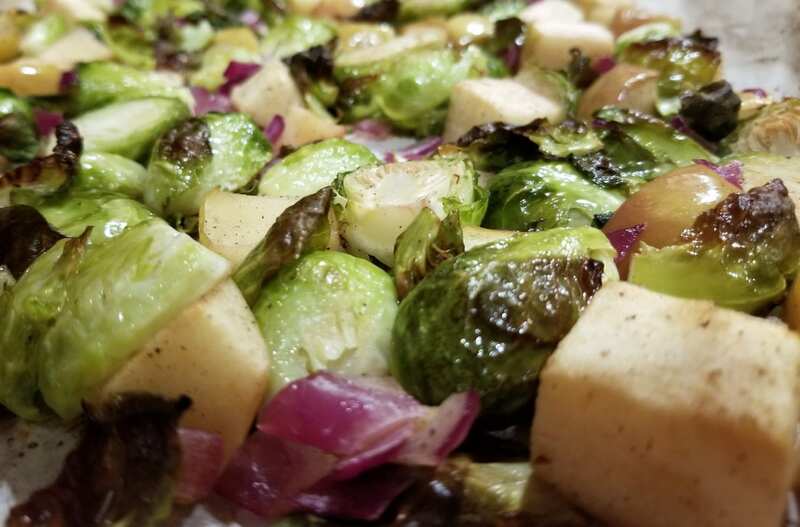 On the sheet pan, toss apples, brussels sprouts and onion with olive oil and salt. Smooth to a single layer. Roast for 10 minutes, stir, and roast for an additional 10 minutes or until tender as desired. 3. Transfer to a serving dish, add pepitas and drizzle with balsamic vinegar and honey. Toss gently to coat. Serve and enjoy!